I recently wrote an article about prefabricated homes, but I wanted to pass on some history that didn’t make the final cut. Prefabricated homes were nothing new in the 1940s. Since the late 19th century, companies such as Sears and Aladdin made kit homes—a numbered set of pieces. Though ready for assembly, these still required many hours of labor. In 1936, the Gunnison Housing Corporation started shipping prefabricated “MagicHomes” from New Albany, Indiana. Before founding National Homes, the Price brothers sold Gunnison homes in Lafayette. 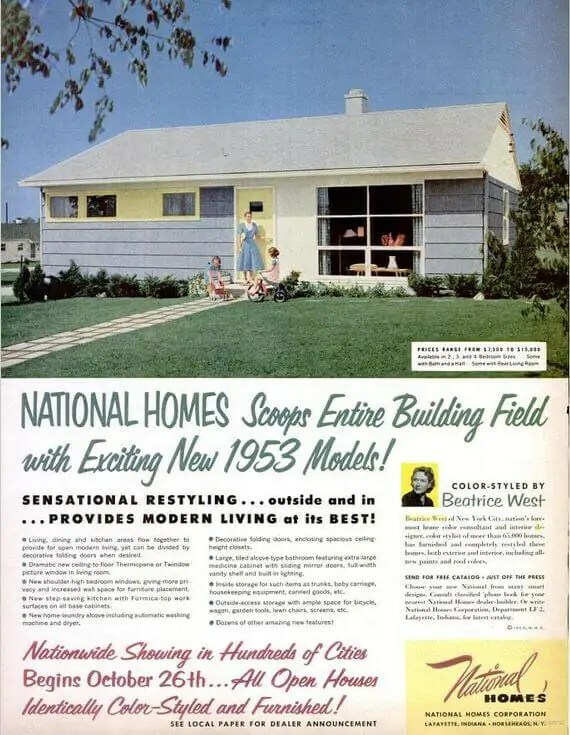 But National Homes became popular starter homes for returning GIs in the post-war years, competing with Gunnison and Lustron, which started building reinforced enamel, prefab homes in 1947. Homeowners purchased the plot, poured a concrete slab, then constructed units starting at $2,000 for a two-bedroom and $2,400 for a three-bedroom in the 1940s. In the great U.S. housing boom, no one has done better than James Robert Price of Lafayette, Ind. As founder and boss of National Homes Corp., Price has succeeded where many another failed: he proved that a prefabricated house can be mass-produced and sold at a profit without looking like a Quonset hut. Last year Price sold 14,127 nonfarm houses; in 1954 he will account for one out of every 48 started. After attempting to re-structure in the late ’80s, the company filed for bankruptcy in 1991. However, a large amount of homes are still around, usually without the occupants even knowing it, even though the company is gone. Read my full article about National Homes and the problems encountered while remodeling here.